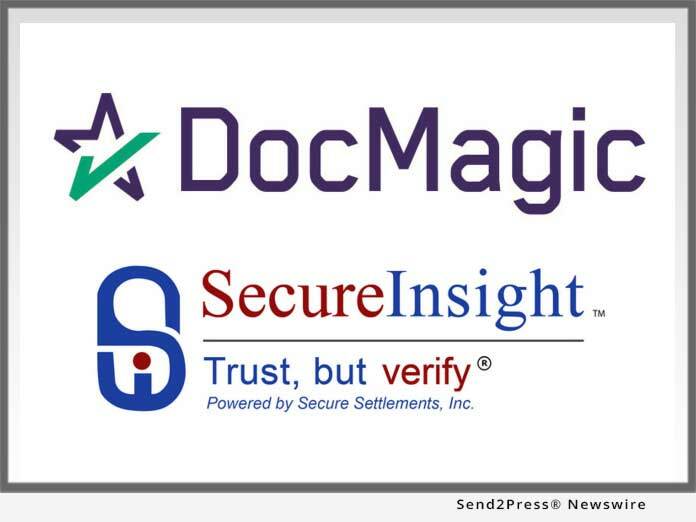 WASHINGTON, D.C., Oct 15, 2018 (SEND2PRESS NEWSWIRE) — Secure Insight, a New Jersey-based data intelligence and vendor management firm, announced today at the MBA’s Annual Convention & Expo that it teamed with DocMagic, Inc., the premier provider of fully-compliant loan document preparation, regulatory compliance and comprehensive eMortgage services, to develop and host an online training program to teach attorneys, title agents, notaries and other entities how to accomplish clear, compliant and completely paperless eClosing transactions. Secure Insight noted that while lenders have made good progress installing digital mortgage point-of-sale solutions, it is just the initial step to implement a true eClosing solution. DocMagic developed Total eClose(TM), a comprehensive solution that enables a 100 percent paperless eClosing process from start to finish using a single-source vendor. The online training is officially set to launch on November 15, 2018 and will be available through a link on Secure Insight’s website. To learn more, contact Secure Insight at info@secureinsight.com or (877) 758-7878. Secure Insight, the brand name of Secure Settlements, Inc., is the first company to offer a standardized risk management process and information database of fully risk-assessed mortgage closing professionals that protects consumers and lenders, reducing fraud and ensuring that federal regulatory requirements are met. Secure Insight monitors tens of thousands of title, settlement and real estate legal firms and professionals nationwide through proprietary technology and the mortgage industry’s only National Settlement Agent Database. This database is accessed daily as a fraud prevention tool by state and federal banks, mortgage lenders and credit unions throughout the United States. For more information about Secure Insight please visit http://www.secureinsightsales.com/.